Frigate Bay Frontline waterfront overlooking 12th tee, lakes, ocean. LOCATION! LOCATION! LOCATION! `The St. Kitts Babe, Villa Angeli de Luci--one of the safest and best Frigate Bay locations--offers frontline waterfront golf course real estate with spectacular sweeping views across golf course and lakes to the Atlantic Ocean. The lovely property has a very rare enclosed yard/garden and a private walkway to the championship Royal St. Kitts Golf Club. The 2bd/2ba deeded freehold, detached home was designed as one large single family residence or two complete residences. The lovely property overlooks the 12th tee & fairway, the 13th tee, back fairways and the 18th & 19th holes with sweeping unobstructed views of the Atlantic Ocean, the golf course and lakes eastwards towards the SE Peninsula mountains. The current library/office next to Master Bedroom could be a small 3rd sleeping area with the possibility of additional sleeping space with minor renovations. Downstairs offers a bedroom suite with full kitchen, laundry room, bath, veranda, garden, separate entrance with a lockable door to upstairs. The picture book setting, just a few steps away from the only course where you can play golf with the Atlantic Ocean on one side and the Caribbean Sea on the other, provides a private plunge pool, enclosed yard with tropical garden and private walkway to the Royal St. Kitts Golf Clubhouse, Putting Green, Driving Range, beach and Marriott Resort & Casino. Perfect for a discerning savvy investor or group of investors pursing the dream while earning worry free substantial lucrative income when not in residence. St. Kitts, rated by "The Robb Report" as one of the top 20 islands for living and investing, has a strong high-end rental demand for tourists, medical students and professionals. The private home has been owner occupied and only used 15 weeks total since 2003 completion. Thank you for your consideration. Please contact the Seller with any questions you may have about the property. Features	 *Appliances *Pet Friendly *Laundry Room *Pool *Balcony *Terrace *Patio *Cable TV *Ocean View *Lake View *Mountain View *Lake Waterfront *Asking Price: $630,000 with 5% agent fee *Land Area: 7,311.16 Sq ft (679.92 Sq m) *House Area: 2,226.00 Sq ft (207.01 Sq m) *Construction is block and stucco. Floors are reinforced concrete with ceramic tiles under rool, Mexican tiles on pool deck. *Frontline Waterfront Royal St. Kitts Golf Course location on small bluff overlooking 12th tee, golf course, lakes and ocean. *2BD/2BA with easily small 3rd Bedroom and potential for more sleeping space. *Enclosed Yard and Garden with custom fence and serpentine rock wall. *Private Walkway to Golf Club, Driving Range, Putting Green *Kitchens have solid hardwood cabinets, upgraded black General Electric microwave ovens, stoves with self cleaning ovens, dishwashers, tile counters, frost free refrigerator with ice maker. Trash compactor and GE Side-by-Side refrigerator upstairs. *Baths have tile floors & vanities. Bathtubs with showers, oversized lavatories with designer fixtures. Upstairs jacuzzi with hand-held shower fixture. *Library/Office with custom shelving adjacent to upstairs Master Bedroom could easily be a small 3rd Bedroom. Private entrance to pool & veranda. Possibility for additional sleeping space. *Gated lower veranda with private entrance and enclosed garden *Private Plunge Pool cleaned twice weekly with 35% Food Grade Hydrogen Peroxide (no chlorine) *Custom Arbor Entrance with Driveway for two small cars *Sweeping majestic unobstructed views of lakes, course and ocean. *Short walk to beach, Marriott resort, spa, casino, restaurants, bars. *The 3br/3ba villa next door (c.2003) is listed for $1,200,000. *Night security patrol *Mercury and dusk-to-dawn security lights. *Custom storm boards. *Pool Pump/Storage Room. *Additional space in garden for expansion or enclosures. *7 Ceiling fans in living/dining area, kitchen, bedrooms and bathrooms. Remote controls. Light dimmers *Doors are imported hardwood French doors with adjacent louvered panels for ventilation *Windows are imported hardwood louvered shutters and screens. *Private Enclosed Yard with Tropical Garden and Serpentine Rock Wall. Custom Lattice Fence w/Gate. *Ceilings are Cathedral height, exposed painted or pickled wood, tongue and groove planking. *Pet Friendly -- small animals need to be watched. 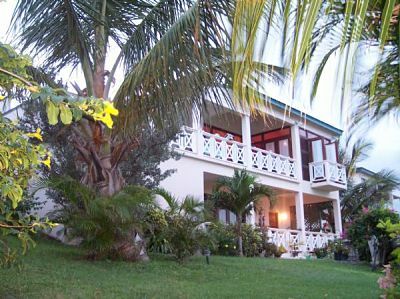 *Private walkway to Royal St. Kitts Golf Club, driving range, greens, beach and Marriott. *Royal St. Kitts Golf Club Membership obtainable (excluded.) *Lucrative rental income potential. High-end rental in high demand *Housekeeping and Rental management available. *Homeowner’s Fee US$292/month paid quarterly *2010 Property Taxes $662 (paid June 2010). *Wired for telephone, cable and internet on both levels. *Central water, sewer, electricity, air-conditioning included. One electric meter. Enclosed tropical garden with private walkway to golf club, putting green, driving range, walking & jogging paths and lakes. A short walk past clubhouse to beach, restaurants, bars & Marriott. A splendid rainbow visited The St. Kitts Babe after an afternoon shower. The championship Royal St. Kitts Golf Club, the only golf course where you can play golf with the Atlantic Ocean on one side, the Caribbean Sea on the other side.